In a Mar. 15 letter to Mosaic, Cheryl Seager, EPA Region 6’s director of compliance assurance and enforcement, noted that the company had worked to reduce the water levels to a level of 180 feet. Based on a stability evaluation performed by a third party, the engineering firm Ardaman & Associates, the company said that level would be adequate to stabilize the stack. Ardaman believes, based on its modeling, that “a breach at or below the 180-foot elevation will not result in a release of process water outside the stack,” the letter stated. As of Mosaic’s daily situation report on Tuesday, the latest available in LDEQ records, the level of the water atop Stack No. 4 was 179.9 feet, and a little over 402 million gallons in volume. But Seager wrote that EPA and LDEQ remain concerned about the stability of Stack No. 4. Seager went on to say that such a rate of underground movement means the stack “remains in a slow failure mode,” even with the water at a 180-foot level. It doesn’t appear that Mosaic is immediately agreeing to that request. Throughout the crisis at Stack No. 4, Mosaic has shifted millions of gallons to other ponds at its plant site in Convent. It has at least five such ponds of assorted sizes now, including the new “East Cell” pond, which has a capacity of about 483 million gallons and was completed in early March. Mosaic began transferring water from the pond atop Stack No. 4 to the East Cell on March 7, but suspended the transfer on Friday, the same day that EPA dated its letter requesting that the transfer operation be resumed, according to the daily situation report. The EPA referenced its view that the “stack remains in a slow failure mode, implying a safety factor below unity.” Ardaman’s modelling suggests, with the Stack No. 4 water level at a 180-ft. elevation, that the safety factor is at 1.10. 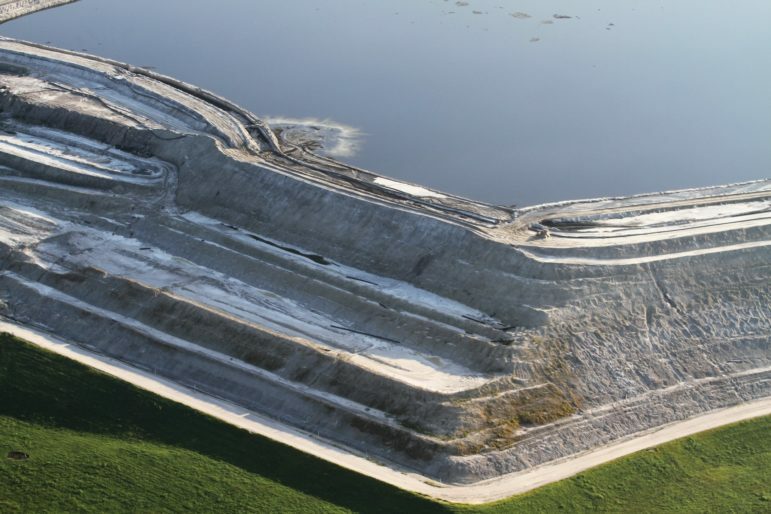 Such safety factors in the engineering sense represent calculations of the forces that a dam such as the gypsum wall can sustain, according to Dr. John Christian, a professor of civil and environmental engineering at the University of Massachusetts Lowell. Concern about a potential dam breach has focused on the potential environmental impact on Blind River, which biologists and other scientists have warned could kill a wide range of animals and vegetation as the river drains into Lake Maurepas in the Lake Pontchartrain Basin. The water itself has a pH factor between 2 and 3, which is a dangerous level of acidity to put into an environment that has not evolved to handle it. Mosaic’s worst-case scenario assumed that any breach would likely occur toward the top of the northern wall, about 185 feet above grade. Their modeling assumed that up to 159 million gallons might escape over a seven-day period, but that such a volume would be held on site by berms and blocked culverts along two nearby highways, LA 3214 and LA 3125.